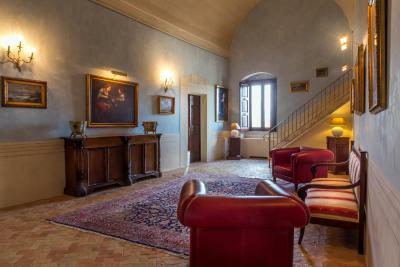 Lock in a great price for Palazzo Viceconte - rated 9.5 by recent guests. Awesome. The views form this magnificent building alone were worth the stay. It's also an outstanding town house. Fabulous. The surrounding areas were excellent and the views were outstanding. Good breakfast, nice room facilites but would have loved tea/coffee making facilities in the room. Shower/bath - great! Amazing hotel and the staff were so friendly, they could not have been more lovely. They helped me manoeuvre my car in and out and opened breakfast early for me! Huge room, great view, central location right near Casa Noha. What a magical place. 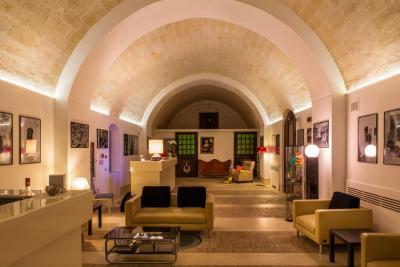 From the minute we entered the staff were incredible helpful in assisting with cars, parking, restaurant suggestions, tours The room was fabulous with the view of Matera. Rooftop brilliant, breakfast delicious. What a great place! Everything: Staff going above and beyond to help (front desk staff came with us and drove our car to the parking area as the town is tricky to navigate; rooftop bar staff very nice as well) Location is perfect - 2 min away from Duomo. Room was big and clean, breakfast excellent. You have parking available in the property for EUR20 per night which is most welcome considering the location, and convenience of having the car there when you leave in the morning. This is because the hotel gives you permission to drive though pedestrian areas to reach the hotel. Views from the roof terrace are amazing, and the art collection on the 1st floor en route to the breakfast room is amazing - Like being transported back in time. Room was clean and bed very comfortable. Perfect location. 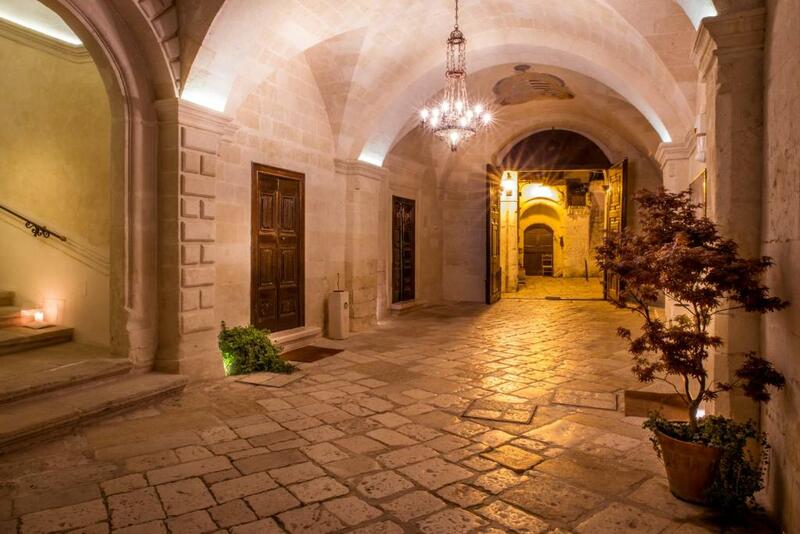 Palazzo Viceconte is a historical building set in the Matera Sassi UNESCO site area. It offers free WiFi throughout. The Viceconte's rooms feature antique furnishings, free wired internet access, digital TV, and air conditioning. 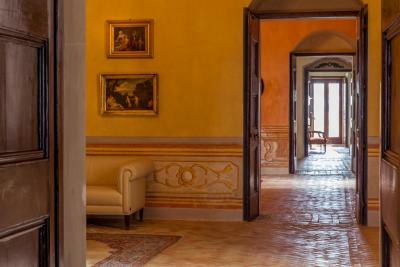 Most rooms boast panoramic views, while some overlook the Palazzo's quiet internal 17th-century courtyard. 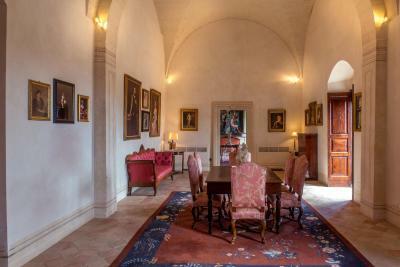 The Palace features beautiful frescoed halls that come with original furniture, and a collection of paintings ranging from the 17th to the 20th century. Staff at Viceconte are multilingual and can assist in the organisation of tours, meetings and excursions. 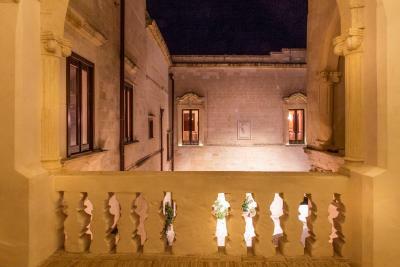 The Viceconte Palazzo is just around the corner from Matera's Duomo cathedral. This is our guests' favourite part of Matera, according to independent reviews. 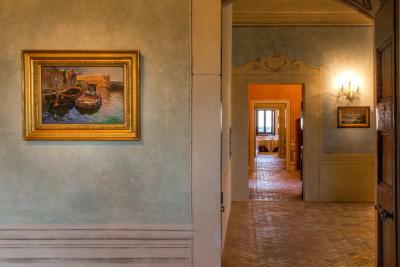 This property also has one of the best-rated locations in Matera! Guests are happier about it compared to other properties in the area. Palazzo Viceconte has been welcoming Booking.com guests since 29 Mar 2010. 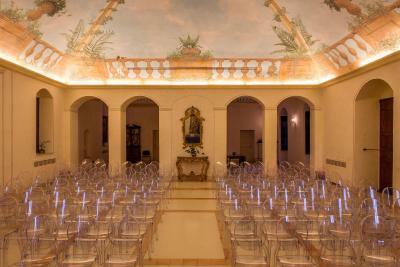 When would you like to stay at Palazzo Viceconte? Elegant and welcoming, this ground-floor room has direct access to the internal courtyard. It includes free Wi-Fi, a minibar with free water, and a 32" Plasma TV. The comfortable junior suite is elegantly decorated. 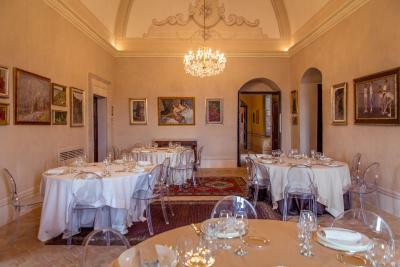 It has views of the Sassi, the Murgia plateau or the 17th-century courtyard of the Palazzo. 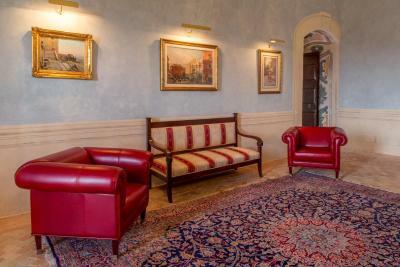 This suite has panoramic views of the Sassi, antique furniture and a large bathroom. Set on the top floor, this spacious junior suite features a furnished terrace, a bedroom, and a separate seating area. It offers free WiFi, a minibar with free water, and a 32" Plasma TV. 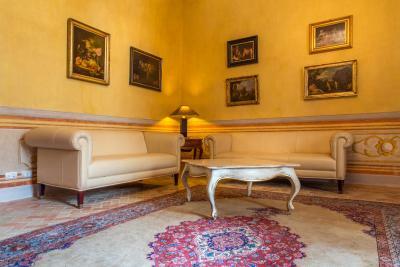 This large suite has panoramic views of the Sassi, antique furniture and a large bathroom. Set on the top floor, this spacious room features panoramic views of the Sassi di Matera archaeological site. It includes free Wi-Fi, a minibar and Plasma TV. Matera’s old town is an astonishing network of cave houses, known as ‘sassi’. Bars, restaurants and hotels are built into the limestone rock face and you can take a walk through uninhabited caves. House rules Palazzo Viceconte takes special requests - add in the next step! 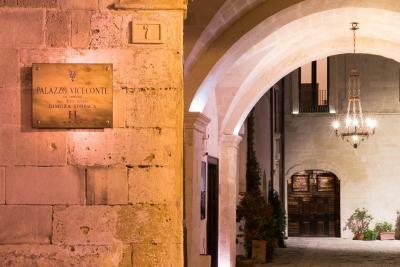 Palazzo Viceconte accepts these cards and reserves the right to temporarily hold an amount prior to arrival. Please inform Palazzo Viceconte in advance of your expected arrival time. You can use the Special Requests box when booking, or contact the property directly with the contact details provided in your confirmation. One of the most picturesque neighbourhoods in Matera! It's a number to get to as it's in the old town where no vehicles are allowed in the day. You need ot organise a pass in advance by talking to the hotel..I was last minute so I ended up walking! No tea/coffee facilites in room. Also, bottles of coke in mini bar, but no bottle opener to open them. Only small thing I know. It's a beautiful palace/ museum with only 14 rooms. Museum quality and quantity art that you can enjoy as much as you want. Very good breakfast! Great location. Parking right on the premises! Booking.com did not let us know the restaurant was closed. This caused us real problems as one of our group was on crutches. The hotel was impossible to find by car. We had to hire a taxi to guide us there. This is an ancient cliffside city, and we felt some hint of the difficulties should be given, not just to say parking was available. The rooms were large and comfortable. I DID NOT LIKE LEAVING !!!! We stayed in A PRINCE CASTLE WITH HUGE ROOMS AND 15 TO 17 FEET CEILINGS. 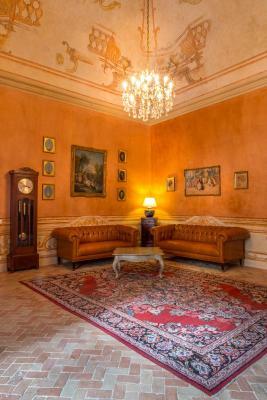 The ANTIQUE furniture in both rooms-we had a HUGE SUITE - was in competition with the collection of art - paintings on the walls and sculptures everywhere!! WE SPENT HALF DAY VISITING THE HOTEL ADMIRING THE ART !!! Can't say there was anything I didn't like - They are apparently opening up a bar on the roof terrace, which would be awesome to be able to sit outside on the property and enjoy the wonderful views over Matera. It wasn't the most ambient of hotels, it was quite empty with lots of unused rooms. Breakfast was very quiet and the overall atmosphere was not buzzy like the rest of the town. There is no bar and there is a roof terrace with nothing on it.